About 1985, the five states of Idaho, Montana, Oregon, Washington and Wyoming were declared "a white homeland" by a number of Christian identity, white supremacist, neo-Nazi, and Klan groups. Jews, African Americans, inter-racial couples, Muslims, gays, lesbians and other minorities became the target of harassment, assault, and in some notable cases, murder. Billings, MT, had its share of displays of bigotry based on religion, race, and sexual orientation: desecration of a Jewish cemetery, harassing phone calls to Jewish homes, swastikas on the home of an inter-racial couple, etc. But then something happened in 1993 involving a Jewish menorah that triggered a positive reaction by thousands of people. The subsequent rededication of the second temple at Jerusalem in 165 BCE. Only sufficient oil for one day was available in the temple. But a miracle happened: the lamp burned for eight days until additional oil could be obtained. 3 Hanukkah has since been observed as a celebration of Jewish survival and religious freedom. Jews often display their menorah where it can be easily seen from outside the house in response to a mitzvah (commandment from God) to publicize the miracle. 2 The Schnitzers are a Jewish family in Billings (population 83,000 at the time). 4 Following the mitzvah, they had stenciled a Jewish menorah on the window of their son Isaac, aged 5. (One source said it was an electric menorah.) 5 On 1993-DEC-02, someone threw a piece of a cinder block through the window. It and broken glass fell on Isaac's bed, but fortunately caused no injury. The Schnitzers called the police. The investigating officer suggested that they remove the symbol. This caused a crisis in the home: how could they remove a symbol of Jewish religious freedom in response to fear of further religious harassment. Margaret McDonald, executive director of the Montana Association of Churches, read of the incident in the local newspaper. She imagined what it would be like to have to tell her own children that they could not have a Christmas tree or a Christmas wreath because it might cause an attack on their home. She recalled an event in Denmark during World War II when the Nazis ordered all of the Jews in the country to wear a yellow Star of David so that they could be easily identified. The King of Denmark and many of its non-Jewish citizens took the initiative of wearing a yellow star themselves. The Nazis were unable to easily identify the Jews. McDonald took action. She phoned her minister, the Rev. Kieth Torney at the First Congregational United Church of Christ -- a liberal Christian denomination. She suggested that their Sunday school students fabricate paper menorahs for their windows at home as a sign of solidarity with the Schnitzers. He contacted other clergy across Billings. During the following week, hundreds of menorahs appeared in the windows of local homes as Christian families publicized their solidarity against religious bigotry. The police chief, Wayne Inman, was asked whether this might cause further criminal acts. He responded "There's greater risk in not doing it." The Billings Gazette published a full-page image of a menorah in their newspaper. By the end of the week six to ten thousand homes became decorated with menorahs. The bigots did not withdraw quietly. Someone shot at the sign of the local sporting goods store which displayed the message "Not in our town! No hate. No violence. Peace on Earth." Bricks and bullets broke some windows at the Central Catholic High School whose marquee read "Happy Hanukkah to our Jewish Friends." Folks from town felt the need to organize a vigil outside the synagogue during Sabbath services. Somebody shot an arrow and killed a cat belonging to a family who had displayed a menorah. The United Methodist Church -- a mainline denomination -- had a menorah display and suffered some broken windows. Car and house windows at six non-Jewish families were broken. Someone left a note saying "Jew lover" on a car. But, eventually the harassment faded away. 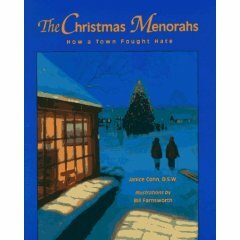 Janice I. Cohn, a practicing psychotherapist, was so moved by the reaction of the Billings community that she wrote a children's book: "The Christmas Menorahs: How a town fought hate." Later, with lyricist Barry James, she created "Paper Candles: How courage and goodness triumphed in an American Town." 7 This is a drama project with optional songs to be performed by upper elementary school, middle school, and early grade high school students. The musical version was first performed in the Venture Theatre in Billings MT, on the 12th anniversary of the rock-throwing incident. I clearly remember discussions I had with youngsters in Billings in early 1994. Even in the early elementary school grades, they were all aware of what had happened in their community. "You just have to show people that you care," one fourth grader explained to me. "If you don’t stand up to bullies, they’ll just keep pushing you around," a fifth-grader stated flatly. "We were scared," said another child, "but my dad, he said it was the right thing to do...."
In fact, research studies focusing on people who have shown extraordinary courage, such as the "Righteous Christians" who risked their lives to rescue victims of the Nazis, and civil rights leaders who fought segregation in the South, concluded that many of these individuals were greatly influenced by the quiet, everyday acts of kindness and goodness they observed on the part of their parents, teachers, and neighbors.